Boss has announced the launch of the Loop Station World Championship, a change to win $3,000 in gear, and a trip to the Winter NAMM 2010. Guitarists, bassists, keyboard players, beatboxers, looping musicians of all sorts: BOSS® wants you to bring it on. 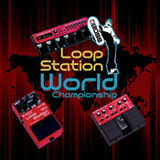 BOSS Corporation is pleased to launch the Loop Station World Championship. Start by submitting a video performance with any BOSS RC-Series looping product, and the result could be a trip to the U.S. Finals in Hollywood, California. Or, better yet, $3,000 in BOSS gear and a trip to the International Championship at Winter NAMM 2011 in Anaheim, California.